Wow. This rewatch of Gloria has confirmed my original thought that Gloria is one of the little known Kdrama gems out there. It deserves to get more recognition than it gets. “Gloria?” you say, “never heard of it.” Exactly. The first time I ever started watching this drama, it was right after the epic Smile Dong Hae and I certainly wasn’t looking to get into another long commitment. I started the first episode of Gloria because I was busy and didn’t want a show I’d be super hooked on. From the description, I figured Gloria was just what I needed . Na Jin Jin and Ha Dong Ah grow up together. Jin Jin dreams of becoming a singer, while Dong Ah, a gifted fighter, turns to a life of working for the mob. Jin Jin gets a job as an underling at a local nightclub and Dong Ah remains her loyal friend supporting her as she struggles to look after her mentally handicapped sister. One day, Jin Jin gets her big break when the nightclub’s singer doesn’t show up, and Jin Jin gets the chance to perform. After seeing her sing, Lee Kang Suk, the illegitimate son of a wealthy family, begins pursuing her—but many obstacles stand in the way of their budding romance. Don’t forget! 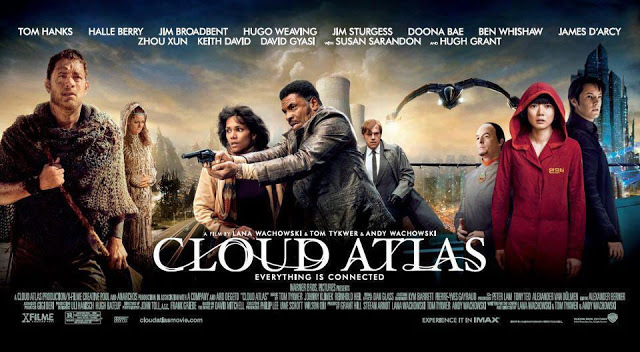 Today Cloud Atlas opens. Why should we, Kdrama lovers, care? Well, I’d like to say it’s because we should change things up every now and then, but that would be a lie. We’ve got a total Kdrama link in our Tom Hanks movie. 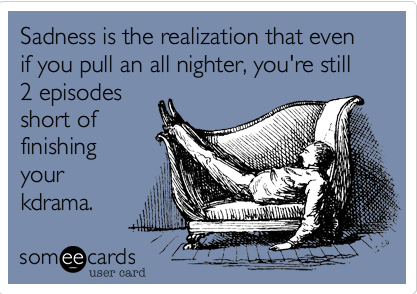 We’ve all had these shows haven’t we? Those shows, where you just NEED to know what happens? Those shows which make you play the “Just one more episode game” until you look outside the window and realize the sky is turning light? When coworkers may think that you’re working diligently but really your mind is on the latest wrench the Big Bad Kdrama Mama has thrown at your couple? Yeah, that’s the sort of shows I’m talking about. These shows, good or bad, for some reason capture our attention and just won’t let go. When you’re watching these shows, time will just fly by and you’ll look up realizing you haven’t eaten in 8 hours. During these shows, there is usually a great deal laughing, crying, or general shouting at the screen. And at the end of the episode? There is either the mad scramble for the remote or the legendary bathroom sprint (because, heaven forbid I go while the show is on, or take the extra minute that it would take to walk up stairs rather than climb them at a dead run).